Right now I’m blogging from the road. I’m traveling with the love of my life, Ms. Dixie Cox: cowgirl, lover, and my best best best friend. We’ve been together going on twenty-eight years, married a little over one. 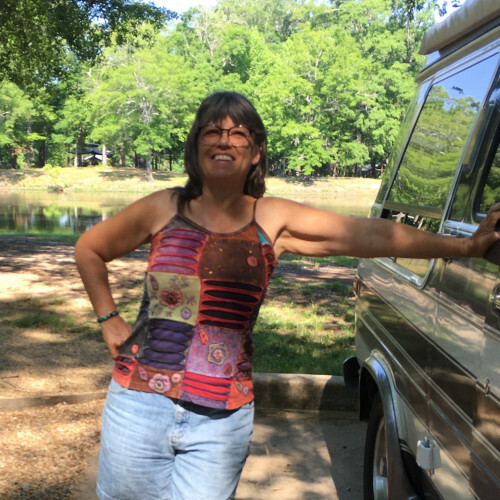 I just turned sixty, and for my birthday we’re taking this road trip across the USA in our ’91 Chevy Conversion Van, Maude. The trip is scrambling my brain something awful. Every day something new to see, to learn, the old routines left in California where I live on the Monterey Bay in a funky little city called Santa Cruz. But the old routines are waiting for me; I know it. They’ll tackle me the moment I step into our 1928 bungalow. But that’s okay; I like my routines. And I like to think that maybe, just maybe, this trip will shake them up a little, refresh them, so to speak. But for now, it’s all new new new! Of course, in the two-plus months we’ve been traveling, we’ve created new routines. Had to or we’d go mad—and never be able to find anything. There are routines for rain: set the awning at a slant so the water will roll off. Routines for wind: do not put out tablecloth as it could blow off, even if we use the cool clips, like it did at Carlsbad Caverns. Routines for extreme heat or buggy situations like when we were in the Adirondacks with mosquitos the size of helicopters: use magnets to affix screens onto windows, roll down screen door. Routines for desert heat like in the Anza Borrego: choose a site with shade, roll out awning, place sunshades in windows. Routines for cold like in Albuquerque where we had snow: pull out big bear blanket, place insulation shades in windows. Nothing like camping to make a person really conscious of weather! But weather affects us all the time. Which is something I thought a lot about when I was writing Perfect Little Worlds. Set in 1989, in Santa Cruz, California, the story marinates in the unseasonably warm weather preceding and following the Loma Prieta Earthquake (often called the World Series Earthquake). Earthquake weather, they call it, though there is no scientific evidence that unseasonably warm weather is an indicator of shifting tectonic plates. Still, I lived through that earthquake, and I’m here to tell you, it was unseasonably warm for October. I’m also here to tell you, when the earth beneath you rips and tears, thunders and rolls, it changes you. Or it did me. Talk about affecting my routines! A couple who’d lost their home moved in with me, one of whom was experiencing major PTSD. (While trying to leave her house, she fell into a crevice between her house and the outside stair unit, which had ripped from the house.) With each aftershock, she’d scream and shake uncontrollably. Besides that, I was suddenly without a job. When the earthquake hit, I’d just stepped out of the bakery where I worked. The huge plate glass window exploded before my eyes. In the days to follow, the building would be condemned, then later demolished. How did the earthquake change me? What was once predictable was no longer. Every moment I was alive was filled with urgency. The things that were important to me became even more important. And so it is for my two fictional middle-aged sisters in Perfect Little Worlds. In the wake of the earthquake they do something some might deem heinous and others might deem merciful. But are they to blame? Or is it the earthquake that makes them do what they do? I’ll let you answer that question. And as always, thank you for reading! You make the world a place I want to be.